Lock in a great price for Ios Palace Hotel & Spa – rated 8.8 by recent guests! Very nice rooms and location. Breakfast was excellent. Amazing views, the room was nice and comfortable, the only thing is it smaller then the photos look but more then enough room for two people to stay in. Everything was clean and beautiful, felt very safe staying by myself. The staff were always so friendly and bubbly! I wish I got time to try their spa and treatments. Firstly, the staff are AMAZING! Really enjoyed talking to all of them, so sweet, kind and helpful. Second, the cocktails were sooo good! They even have a Bloody Mary that they make with a chilli pepper infused vodka that was 👌🏽 so good! The pool was great to chill at. Room was all we really needed. Breakfast was good. The staff were all so friendly and engaging. Food was excellent. The location is #1. May is a great time to visit if you like the quiet and 75-80 F temps. We had a gorgeous view of the beach, the location was outstanding, the food was delicious and the pool was gorgeous. We got a very good deal on our room since it was the end of the season. Very happy with our stay. Paradisiac place with an amazing view. Nice bar in the pool area and great staff. My room was perfect! best holidays ever! Restaurant at the pool was excellent. Front desk staff was great too. This hotel is beatifully designed and has breathtaking views. 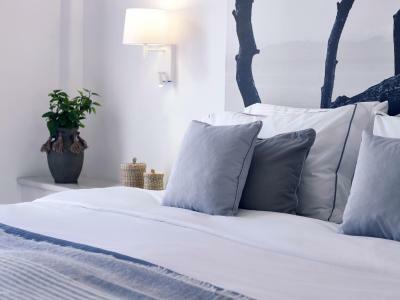 Ios Palace Hotel & Spa This rating is a reflection of how the property compares to the industry standard when it comes to price, facilities and services available. It's based on a self-evaluation by the property. Use this rating to help choose your stay! 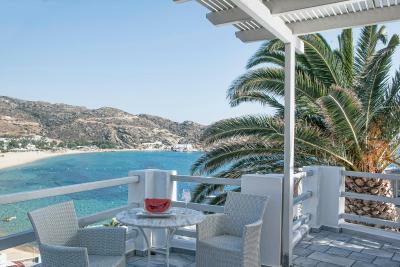 Ios Palace Hotel & Spa offers a complete range of accommodations options, all with balcony overlooking the picturesque Mylopotas bay. At the swimming pool, guests can relax and enjoy a cocktail by the pool, swim up while listening to music underwater, or enjoy a light lunch prepared by the hotel’s experienced chef. 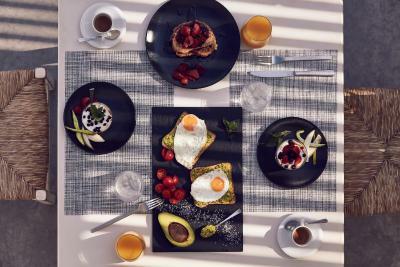 Tomatini , the hotel’s brand new restaurant travels guests around Cyclades islands by offering tastes of the nearby islands. The Margarita Bar serves the longest list of margaritas in Europe. 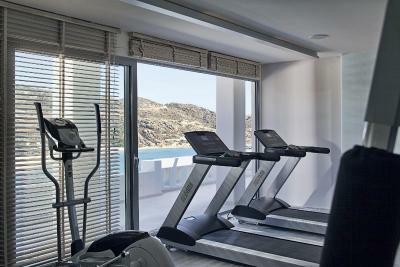 In addition to the 3 swimming pools, Ios Palace Hotel & Spa offers a range of luxuries which include a fitness center, a spa center and massages. 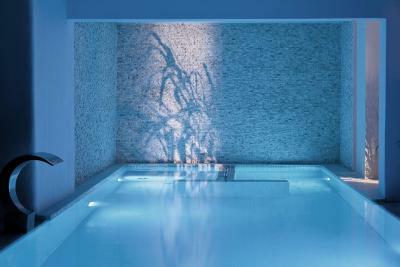 When would you like to stay at Ios Palace Hotel & Spa? 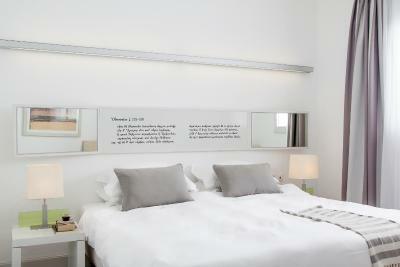 Located on the 3 first floors of the premises, these rooms offer spacious balcony with sea view. 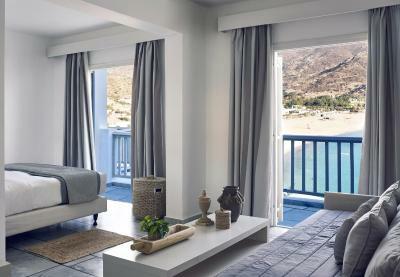 Newly renovated rooms with bathroom with shower and balcony with panoramic sea view. 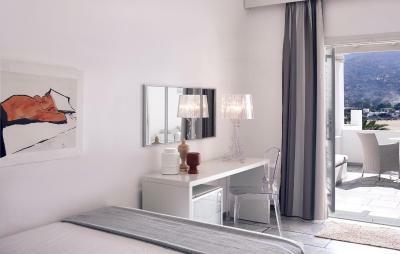 Modern suites, situated in the 3rd floor, offering a sitting area, bathroom with bathtub and balcony with sea view. 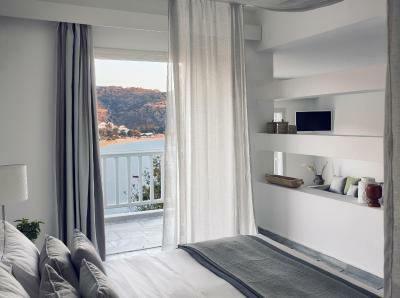 Located at the top level of the resort offering panoramic sea view over Mylopotas bay and the Aegean Sea. 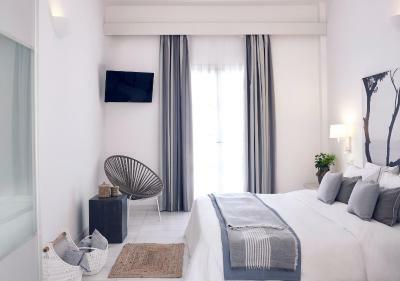 They consist of 2 bedrooms -an open plan seating area is available in one of the rooms- 2 bathrooms (one with shower cabin and one with bathtub), terrace with garden furniture and a private swimming pool (11 ft x 16 ft). 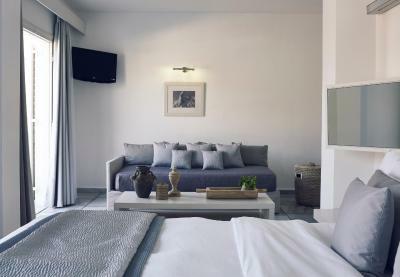 This spacious suite consists of 2 bedrooms, 2 bathrooms and a balcony. An open-plan seating area is available in one of the bedrooms. 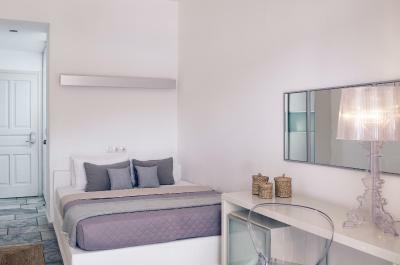 Located on the upper level of the hotel, offering side sea views, this room consists of one bedroom with one double or twin beds and one bathroom with bathtub or shower cabin. House Rules Ios Palace Hotel & Spa takes special requests – add in the next step! Ios Palace Hotel &amp; Spa accepts these cards and reserves the right to temporarily hold an amount prior to arrival. Ios Palace Hotel & Spa accepts these cards and reserves the right to temporarily hold an amount prior to arrival. Please note that for reservations of 3 rooms and above, the property will charge in advance an amount equal to one night's stay. 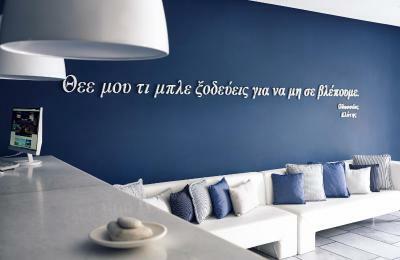 Not overly friendly, not a true Greek experience. My room felt like I was in a different hotel , it was so far away . Overpriced at that time of year. Friendly staff, clean, good breakfast. The hangers in the bedroom cupboard were dreadful. They were for children's clothing and adult clothing just fell off. This is obviously because the cupboard is very narrow because of the space between the cupboard and bathroom. The WiFi is poor and the showers are a little weak and cold. But the hot water generally seems to be that way on many island hotels here - maybe all solar heated? Not sure. We were also there in October which is getting into low season so some parts of the place seemed a little tired and not as well kept as perhaps in the high season. All minor points really though. We still enjoyed our stay very much so. This place is in a perfect location. Beautiful views over the beach and sea. Yet close enough for a walk down for a swim or to the mini mart or restaurants. Also the town is an easy stroll in the evening for drinks and dinner and nightlife. The staff are also helpful and very friendly. They provide good info on tours too. Breakfast was also pretty good. And the rooms were nice and clean and made up wonderfully each day. Welcome drink while someone takes your luggage up in your room, very friendly and helpful staff, two clean pools with gorgeous views, great breakfast, very good services, amazing cocktails, good restaurant open from noon to 11pm, literally on the beach... Great place! My only initial complaint was that WiFi did not work in our room or at the upper pool area. In hindsight, it forced us to "disconnect" from online distractions and recharge properly. 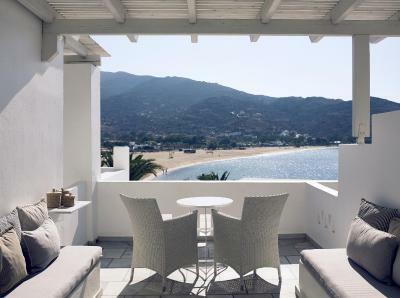 Amazing views of Milopotas Beach, a wonderfully sized room and balcony, comfortable firm bed, some of the best hotel staff we encountered on our entire holiday were here at the Ios Palace - always smiling and happy to help, and really made the experience excellent. We loved the pool areas and spent a lot of our time there. The ambience at breakfast and at the pool areas was relaxing and calm. We thoroughly enjoyed the breakfasts, and lunch here too. We were here at the end of the season (September) and our stay here surpassed all our expectations and we look forward to visiting again. The breakfast was a little disappointing, the exact same food for entire week. The bathrooms were slightly below the 4-star hotel standard in my opinion. The staff were super friendly. Hotel facilities, the pool and the restaurant are really nice and the views are excellent. Location of the hotel is also superb, really close to the mylopotas beach and bus stop. Would recommend it for everyone who wishes to visit Ios. The hotel is abit tired and could do with sprucing up but overall was fine. Staff on front desk could have been friendlier. The views from the pools and rooms are amazing overlooking the fabulous beach. Easy to walk to nearby restaurants and cheap to get bus/cab into town. 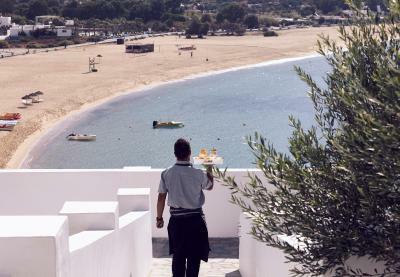 We love Ios it is so cheap and chilled- so much nicer then pretentious Mykonos! The breathtaking view on Mylopotas, the signature cocktails, the swimming pools. Rooms (especial bathrooms) should have been renovated by now. Not everything was working there and this horrible smell from sewers... Hotel is located on slope end if you get room on one of the top floors, where lifts do not come, you will have to walk some steps to restaurant, pools and beach. Great place to stay on Ios island, very close to Mylopotas beach. Two wonderful pools with see water. Many thanks to hotel stuff which was very helpful, even with none standard requests. Have stayed at this hotel twice before and have loved it every time. 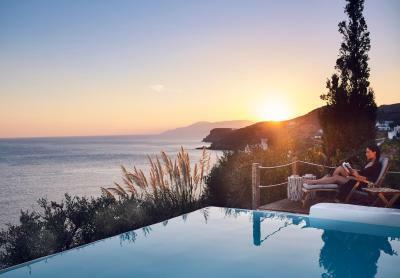 Beautiful views, amazing pool and right on the beach, wouldn’t stay anywhere else in Ios ! Personally I didn’t find the bed to be the most comfortable... but my boyfriend slept well... so really just a personal preference I like a pillow top bed.